Here at The Grass People we have prepared some helpful guidance to ensure that your rugby field is in the best possible condition all year round. 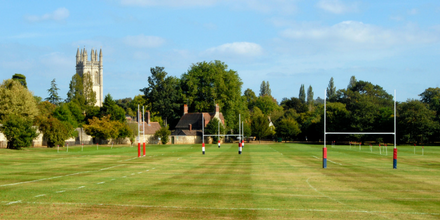 At the start of the season regularly mow the rugby field maintaining a height between 50mm-70mm. Try to repair any damage and if possible chain harrowing the pitch after a weekend’s games. Chain harrowing the morning when the grass is a little moist will allow groundskeepers to create great grass patterns. During late October consider applying a winter fertiliser, as with all fertilising ensure the grass can be washed off afterwards or fertiliser just before the rain. On match days hand fork off any surface water from the field. If there will be games on the field use sand to top dress any areas that may be rutted after scrums, rucks or mauls and prepare to reseed after the games to boost regrowth. As the weather gets colder and wetter groundskeepers will be carrying out the last few cuts of the year. As the weather deteriorates the rugby field will require more attention. Begin by aerating on a dry day and when possible chain harrow. When it is particularly cold roll the grass as this will keep the surface flat. Try to keep machinery off the pitches as much as possible. Don’t go on the pitch when it’s a frosty. As January can be extremely cold ensure your pitch is used as little as possible particularly in very wet or very cold conditions. To avoid the pitch freezing hand fork any standing water and only use the roller and harrow when essential. Try to aerate the field as often as possible. Towards the end of February consider buying a fertiliser for end of season preparations. Begin end of season preparations by fertilising the grass in early March. Grass will be ready for mowing by the end of the month, try to maintain the 40mm length. During the end of March prepare for reseeding and fertilising after the last game in April. During April you may require a contractor to come in and assist with remedial works around the field. In many cases groundsmen will acquire the services of a contractor to prepare and dress the field. At this time aeration is required at a depth of 8- 10 inches at 4 inch centres. Also brush and chain harrow as much of the sand into all the holes and low spots. When these steps are followed and a good level of the field is achieved it is time for seeding. This will ensure that the seed is in the ground at the right depth and covered, ready to grow. Then fertilise evenly across the pitch and roll with the mower to make sure that the seed is in contact with the soil. Then irrigate as soon as possible or wait for it to rain. Growth will be visible in about 10- 12 days. After seeding keep the surface as moist as possible to allow the best growing conditions. During dry spells irrigate as well as possible. Keep off the pitch for at least a fortnight. When cutting begins maintain a height of 50mm and try to mow in different directions with each cut. Also apply a slow release fertiliser over the summer months to maintain growth. Maintain regular watering and mowing but during this period allow the grass to grow to around 50-75mm. If there is a dry spell, try and keep the areas irrigated. This will be difficult to do if it is a long dry spell, but the more grass you can keep now the better it will be later on in the season. During August begin preparations for the season ahead with general grounds keeping maintenance. You will require another summer fertiliser. Keep in mind at this stage training may have recommenced and sections of the field are beginning to wear, if possible section these areas off, feed and water regularly to boost regrowth. Continue to mow the rugby field but not as frequently and increase the height of the cut to 75mm. Aeration to prevent run off when it does rain and to encourage deep root growth. Stop verti-cutting or scarification as this will cause further drying. Do not apply chemicals or fertilizers as they will scorch the grass.